The 11th annual Explore Event at Umpqua Community College is not a dating service. But it certainly provides a forum for people who have a lot to gain from meeting each other. More than 60 exhibits are planned for this year’s Explore Event, set to take place from 5:30 to 8:30 p.m. Feb. 7, in the UCC gym at 1140 Umpqua College Road. Co-sponsored by the Umpqua Valley STEAM Hub, the gathering allows Douglas County students to meet with professionals from a variety of industries, including technology, natural resources and manufacturing. An attendee stands at a booth at the 2017 Explore Event at Umpqua Community College. 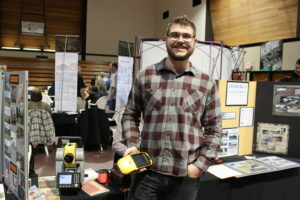 More than 400 people attended last year’s Explore Event, according to Clay Baumgartner, an organizer who is also chairman of UCC’s engineering, forestry, computer information systems and computer science departments. Explore Event 2018 is open to students of all ages, including those from elementary school, middle school and high school. Students’ families are invited as well. Baumgartner said one of the evening’s goals is to provide opportunities for students to make contacts that could guide them into jobs, in both the short and long term. 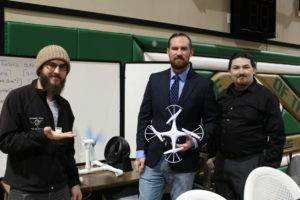 In addition to those mentioned above, representatives will be present from the following fields: engineering, surveying, computing and computer science, automotive, welding and water quality. Information on apprenticeship programs and other types of introductions to businesses will also be available. Dinner is provided and will be served buffet-style, giving attendees more chances to mingle and network. Exhibitors share displays at the 2017 Explore Event at UCC. On the education side, there will be representatives from various UCC departments and clubs, as well as from programs of Oregon State University and Oregon Institute of Technology. “Any students who are thinking they may be continuing with their schooling can find out what is required if they are looking to transfer for four-year degrees. And if they are interested in shorter-term degrees, they can talk about those options and opportunities too,” Baumgartner said. “It’s really unique to have so many representatives from businesses and agencies and industries and schools all in the same location,” he said. Given that Explore Event has such a long history, organizers have been able to hear comments over the years from former attendees who have gone on to work in rewarding careers. In addition, local employers, especially those who may have had trouble filling jobs with qualified applicants, have found it beneficial to use Explore Event as a forum for meeting potential employees. Advance registration is encouraged. To register or to find out more, visit umpqua.edu/explore-UCC, or call 541-440-4605.